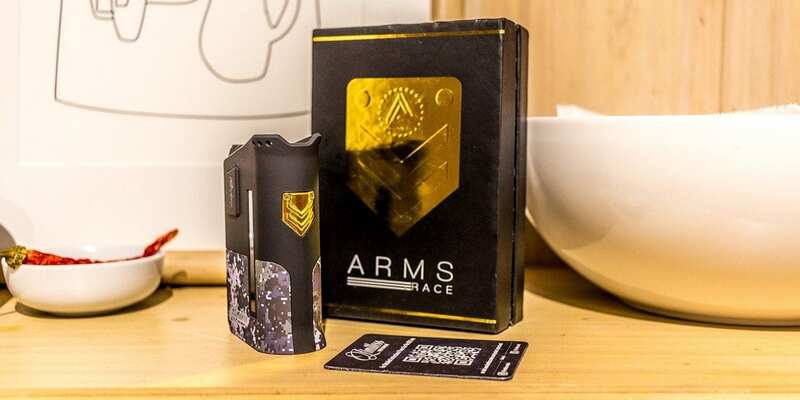 Limitless Arms Race 200w Box Mod Review - Daily Vaping Deals & The Best Vape Product Reviews at Vaping Cheap! The Limitless Mod Company is no stranger to the vaping community and certainly need no introduction. LMC have most recently added a 200W capable box mod to their line up, which is called the Limitless Arms Race. It is a dual 18650 box mod that definitely stands out from the crowded high powered mod market. 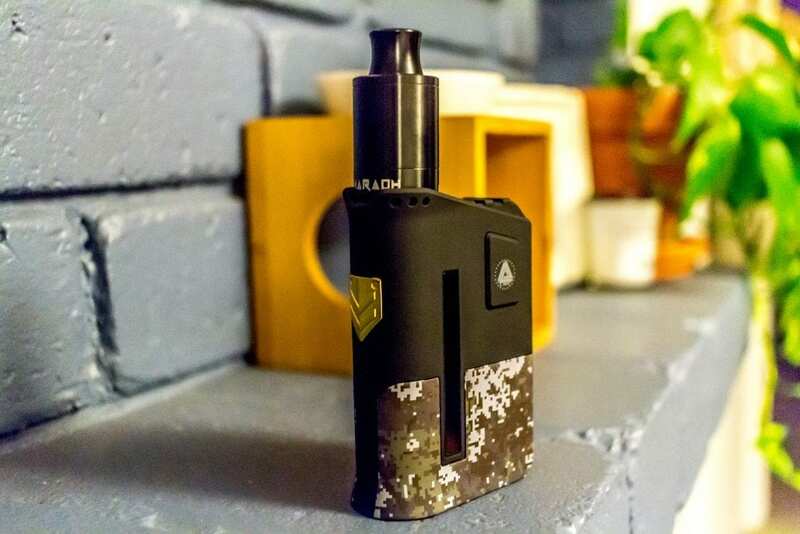 With a distinct Military look to it, the Arms Race features temp control, a magazine styled battery compartment and can hold atomizers up to 25mm. I would like thank GearBest for sending the Limitless Arms Race mod to us for the purposes of this review. 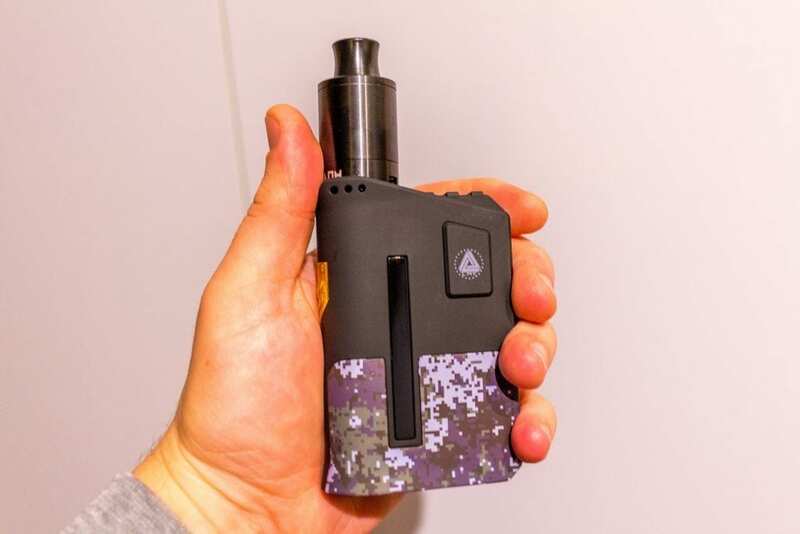 Click Here to Check Out the Limitless Arms Race 200w Box Mod! Packaging for the Arms Race Mod is pretty sleek and good looking. A black box with gold highlights and a giant gold arms race logo on the front. Upon opening the box, there is only the mod and a QR code to be found inside. The QR code is used to link back to the LMC website and download the operating manual. The mod is secured inside the box with enough protection to ensure that it does not get damaged in transit. The mod itself is certainly unique and looks to be well made. It is not as heavy as it looks, however appears to be very sturdy and has the potential to take some heavy use it seems. Made from a durable zinc – alloy the shell just screams military. So LMC have obviously well and truely met their design brief on this one. There is a picatinny type rail around where your atomizer will sit in a very sturdy looking 510 connection. 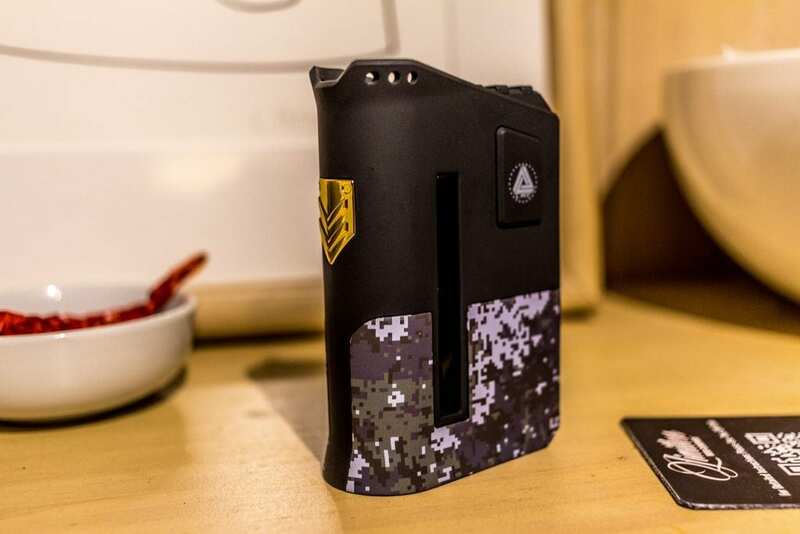 A gold badge, various Limitless logos and a digi camo battery magazine all help this mod stand out from the crowd. The sleeve can be interchanged and is available in Desert Digi Camo, Blackout Skullchief, and Blue Digi Camo. There are no obvious straight edges on the Arms Race Mod and it has a nice rounded contour to it. There is a 0.91″ OLED screen on the side, which displays all the important information like wattage, temperature and battery life. The screen is vertically oriented by the way, however there is a way to change the orientation direction. The battery magazine is discharged from the mod with a small spring loaded switch on the bottom. The weight of the mod definitely comes from the battery magazine. There are no rattles on the Arms Race mod, which is a huge pro in my book. There are three buttons which are nice and clicky and feel solid to use. The also do not rattle around, however they do seem a little flexible but this has no bearing on their performance. To install the batteries, you need to press the button on the bottom of the mod and the clip will unload. The batteries are easily installed and there are battery placement indicators on the mod itself. You will need to use a pair of married high-drain 18650 batteries on the Arms Race mod. The mod does support 2A charging for a quicker recharge cycle and your batteries will be charged faster than most. For a refresher on battery safety, make sure to go back and read our article here. When you have installed your batteries and loaded the magazine back in with a satisfying click, you are ready to turn on the Arms Race mod. Five clicks will turn the mod on and off. Hold the bottom wattage adjustment button down then click the fire button to go into stealth mode and to change the screen view. To access temperature control mode, click the up button on the wattage adjustment button then click the fire button to enter into the temperature control mode. From here you can select Nickel, stainless steel, or Titanium coil settings based on your coil setup. Although most manufacturers recommend charging your batteries via an external charger, the Arms Race includes a micro USB port which enables you to charge your batteries on the go. The USB port will also enable you to upgrade firmware when it is released and available. You can either use the fire button like a trigger, if you hold the curved part in the back of your hand and use your pointer finger on it. Or you can hold it the other way and use your thumb on the fire button. The 510 connection is oriented to the curved side of the mod, so that also may play a part on how you choose to hold it and your personal vaping style. All of the atomizers I installed on the Arms Race were straight forward to screw down. The vaping experience when using the Arms Race mod is very satisfying. It fires instantaneously, probably the quickest firing mod I own to deliver heat to the atty that fast. There is absolutely no delay after pressing the button. All of the modes work as they should and TC mode is no exception. All of my atomizers were able to fire on this mod and I had zero connection issues or mis-reading. There was no ohm jumping or misbehavior from the chip, which is what you want from a regulated mod. LMC are on the right path with this chip and it certainly delivers what is advertised on the box, all the way up to 200watts if you need it to. The display is in blue text and can be a little challenging to read in the bright light due to the text being so small. The screen seems to take forever to scroll through the wattages and settings, maybe something that will be addressed further in future firmware updates? There is no heat transfer to the mod from any of my tanks or RDA’s, which is a welcome feature. The mod stays cool even when you are firing high demand sub-ohm coils that are hungry for power. Battery life, I have to say, isn’t the greatest feature of this mod. I own other dual 185650 mods that can deliver just as much output as the Arms Race, however they seem to last a lot longer in the battery department. The battery meter doesn’t seem to be the most efficient, as it spends most of the time either on full or a quarter. So this is something I cannot really rely on to give me a true representation of where my batteries are. In terms of size, this mod is quite large for a dual 18650 mod. It certainly isn’t the biggest I have seen, nor is it the smallest. I have to say that the Arms Race is more designed for it’s looks and aesthetics rather than being a compact mod. It is certainly comfortable to use, however it is not pocket friendly. Don’t get me wrong, the Arms Race is not a poor performer by any stretch of the imagination. And don’t get me wrong it performs well. There are just a few too many quirks for me personally and this may not be everyone else’s opinion. For the asking price, I would expect the Arms Race to excel further in terms of battery life and navigation. Hopefully this is something LMC can address in future by way of firmware updates. The Arms Race is definitely aimed at the dedicated military die hard and certainly meets the design brief in terms of looks and aesthetics. If this is something that interests you, by all means give it a go. I hope this has helped you in your search for your next regulated box mod. If you have any questions or comments, please don’t hesitate to leave them below, we always appreciate hearing from our avid readers.